Lapperoo, thank you so much for the feedback on the candles. We have a focus on scented soy wax container candles. I believe a lot of what you are describing are molded candles. We did some for Christmas last year, those are the ones you noted, and they are all out of beeswax. Soy wax doesn't mold well at all, which we found out the hard way!! As we scale the business we will certainly think about branching out into all different kinds of candles so we love to hear what people might like. Jen, keep on going!!! You've got this!! My week was busy and full of interviewing. Literally 18 hrs of interviews at 8 different companies. Needless to say it was an exhausting week. But that's a good problem to have. There are 3 companies where it's getting close: one I did a 3.5hr in-person interview this week and the other 2 have similarly long in-person interviews scheduled in the next week. I'm excited but also nervous that they won't give me an offer. I'll keep you posted :). I'm also finally seeing weight go down a bit again :). And my parents are in town this weekend, which is nice. Next week, I'm gonna keep getting my workouts in, try to spend a lot of time in the garden, and then interview of course. Lapperoo, I buy the earrings premade (eBay, Amazon, etc) and then paint on them. They're just acrylic pendants. I use an oil based lettering enamel to paint the designs. The same stuff used on signs, hot rods, motorcycles, etc. The designs are freehand, whatever I come up with from whatever I've been looking at lately. I've been super lazy this week, but also feel like it's pretty needed. Eating pretty well though! I hope some of you who don't generally post will drop a line once a week? A month? Sometime? We'd love to hear your day to day stuff and that's a way we'll get to know you better. I am most committed to my BLC team "Emerald Gems" which absorbs a lot of my time so I post here about once a week, sometimes more if I have a chance. I've LOVED going to Jen and Heather's websites. Really interesting things you are both doing. Jen: Do you make the earrings and then add the patterns on top or do you purchase the earring already made and add your images to them? I'd love to know how you do this. Is it resin? Acrylic? It looks a bit gel-like so I'm guessing you use some sort of resin rather than enamel. I enjoy your free forms. How do you come up with the idea? I'm not sure how I would approach that (at least as a beginner at it). My metals work a lot of times is based on the stone(s) I will be using, colors and patterns in the stones. I like textures too. I don't think in patterns and their flow which is something I should work on developing. Lovely work on your site. CalGal: good luck with the moving stuff and especially the repairs. You're a wonderful friend to do this. Having someone to join you as you pack up, toss out, and fix things makes the task sooo much more pleasant and, fun too. Heather: I loved the Christmas candles on your site. I can see ordering some pine cones for sure and also like the snowflake patterns. I'm not sure what the name is for this but I'll describe: a candle hold that is made of wax (with or without piercings; with or without embedded flowers or leaves/seeds). I like the softness of the light through the holder. I've got one small round and one large oval that I put tea lights in the bottom but could put a small fat-based candle. I wonder if you could produce something like that? How about summer themes such as sailboats, sea creatures - crabs, starfish, or shells) that could be either molded and add to the surface or impressed as the snowflakes? I love lemon verbena in the k itchen or ginger and citrus combos (what the fragrance companies refer to as "green/fresh" sents. Lavendar works well in combo with these too. I'll get in touch with you via your website as I DO want to place an order. It used to be easy to find interesting candles but the past couple of years I've had a hard time just getting candle tapers for my candlesticks. Once on a trip to the wine country in the San Francisco area we took a day trip to the wineries with a stop at a mission candle shop. They had the most unique candles and wide variety of colors. I found some tiger lilies candles that were a perfect match to the flowers in my wallpaper. I've never seen anything like it since. On another trip I found an oval shaped candle that had a glass tube fitted into the top center with a brass wick. You pour oil in the tube and light the wick but the candle never burns down. I love that one in our bedroom. Again, seen once only and not to be found again. Well the GI system is still not fully recovered from the diverticulitis but is greatly improved. Tomorrow is the last day of meds so we'll see how things fair after no meds. I'm praying it's all gone for good. I have a big trip up to Milwaulkee to be a teaching assistant for a metals class teacher and I don't want to miss it! I can lean so much from helping students and learn her new projects too. Plus it's just sooooooo much fun. Say some prayers for me everyone. Time to get to some paperwork. Have a good one! Photo: not the best lighting Crosses: on the left: Celtic patterned fine silver (FS) cross pendant/ on the right: Sterling Silver (SS) cross with hand twisted SS wire, and hand cut and sgraffito leaves pendant. Realize that our mistrust of the future makes it hard to give up the past. Hi Lapperoo!! That piece is absolutely beautiful! And so is everything else on your website. I'm glad you are feeling more up and you got to spend time with other artists. It's interesting how many creative people we have here. Well, we don't have that many anymore who chat regularly, but many of us who do are also creative. I'm terrible at breaststroke too. As a kid, it was my absolute weak point in the IM races. I loved the other three strokes, but I was so amazingly slow at breaststroke. And now the stroke is done totally differently so I really can't do it right. For me I'm not able to join a pool at this time, so it's really nothing I can even work on. I hope as my life settles a little bit that I'm able to join the Y again. Today is a busy day of client work, personal work, candle work, and a workout! It looks like it's going to be pretty cloudy and rainy today. If the rain holds off I think I'll go do an hour of gardening today. I need to find balance in my life and being outside helps with that. Have a great day everyone! Kourtney, keep us posted on how it's going for you! Thanks to all of you for your comments. It did help with the blues over the weekend. I was sure down about missing my swim events but will now set some new swim goals such as learning how to do that darn breast stroke. I can't seem to coordinate legs with arms and coming up for breath. While I did miss the swim competition my Silver Arts competition I was able to attend the awards and reception to see what everyone had submitted in the arts. I entered two pieces in the jewelry category. I've never competed in anything before so this was a learning experiment. I'm proud to say I took a Silver Medal home for my copper cuff. My husband drove me as last week was up and down with the pain. He had fun looking at things and chatting with the artists. I made a new friend who does wirework who wants to get together to share our jewelry making knowledge with each other. 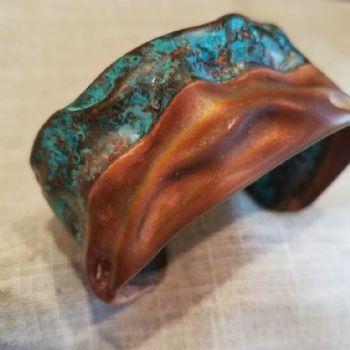 Here's a photo of the copper cuff. If you want to see some of my other work go to www.darielappdesigns.com The site needs a lot of updating but it gives an idea of the range of things I can make. I was able to do some swimming just taking it slow and easy and hope I'm almost over this. Still some aching but things have really improved today. I hope all are having a good week. Thank you for the tips :D. RE gym stuff - how about a 10 class pass? Thank you thank you! Jen - Yeah, Bolthouse does smoothies and juices, literally, by the ton. Kourtney - Changing meds? Well, hopefully that helps. I called your work out place and they said they can put it directly on your account, but I need to know what you want. Definitely walk through the interview in your head a bunch of times. For the in person, practice sitting in front of a mirror and be relaxed. During the interview, check your shoulders and hands from time to time to make sure you're relaxed. Relaxed and assurance are the two biggest factors when I interview people. Heather - Don't think of it as a step down, think of it as a stepping stone to get your business off the ground. I took what could be considered a step down, taking a corporate controllership instead of CFO position, but it was the position I was interested in. I don't have to do all of the interaction with the partners, the Power Points, etc. I get to organize and fix the company and the CFO has to run interference for me. It pays a little less, but not by much. The bonus will probably be a little less...but there is absolutely no stress. I'm taking two weeks off to go up to Oregon and help my best friend move her mother out of her house (on a hundred + acres!). We will need to do a bunch of repairs and try to get it rental ready - sigh. It will be good to move her to Tucson where my best friend lives. It will be a great work out, right? Carol, bolthouse as in the smoothie brand? I bet they do go through a lot of carrots! I used to drink a lot of those before I learned to cook. Kourtney, that's a busy week but I think you'll be good! Getting good food and good exercise will totally help keep energies up too. Heather - break a leg!!! This. Week. Is. Insane. And I also am changing up some meds so I'm a bit more on edge (but have good support so that's good). There's a lazy part of me that's like "oh you can skip working out this week and eat poorly b/c it's already so hectic" but I *know* that good food will fuel me better and that workouts will help with the stress. I have an interview today with a company that I interviewed with two years ago when I was looking. It's not the same job but it looks good (a bit less stress perhaps) so if it pays what I need to make I may have found a good place. I recall when I was looking I really liked it, and I've kept my eye on them the last two years just in case the Controller didn't work out. He's still there, but he needs an Accounting Manager. It's a step down in title and responsibility, and in all likelihood in money too, but it's close to home, it's a nice company, and it could work well for me as I will then have time to focus on my business as well. Say a prayer or think a good thought for me please!! The interview is at 1 pm. I'm going to go work out early to work out some stress. Then I'll spend the morning preparing for the interview and doing other job search things. Team Chat Week of 4/16/18!! Team Chat Week of 1/21/19!! Team Chat Week of 5/7/18!! !